Mercury made three attempts at the Capri. The first was an imported version of the European Ford Capri and was sold from the 1970 to 1978 model years as first the Capri and then the Capri II. 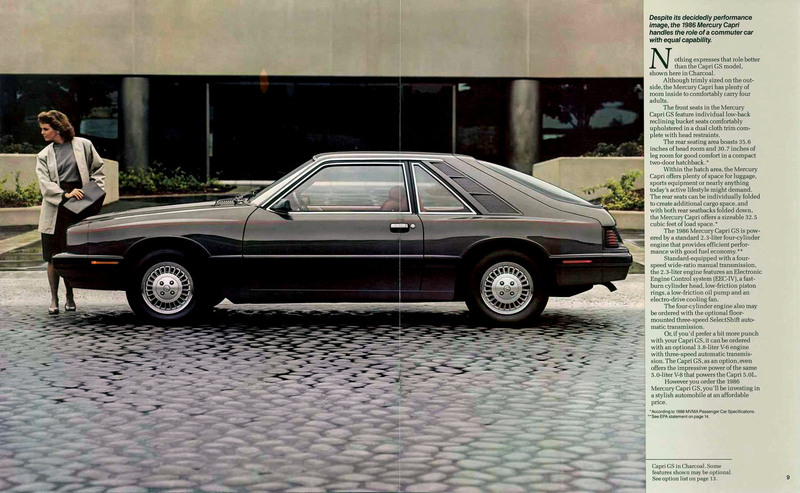 The second was Mercury’s version of the Fox body Mustang and was sold from 1979 to 1986. The final version of the Capri was an imported version of the Australian Ford Capri and was 1991 to 1994. Sense a trend here? For 1986, Mercury’s Capri had three engine choices and two transmission choices. Standard on the GS was the Lima 88 bhp (aargh!) 2.3 liter in-line 4 with one-barrel carburetor mated to a four-speed manual transmission. Power options for the GS included the Essex 120 bhp 3.8 liter fuel injected V-6 and the (wonderful) Windsor 200 bhp 5.0 liter V-8 with sequential fuel injection that was standard on the 5.0L. All three engines could be paired with a three-speed automatic transmission for an additional $510 (the V-6 required the automatic while the 5.0L came standard with a five-speed manual transmission with overdrive). Mileage ratings for the various configurations ranged from 23 city/28 highway (21/26 by today’s standards) for the four-speed manual in-line 4 combination that I’m not convinced that anyone bought to 17/25 for the “big daddy” five-speed manual paired with the V-8. Performance with the 2.3 liter paired with either transmission was ghastly — 0-60 came in about 15 seconds, which meant a Capri driver with the Lima engine would see only the taillights of Iron Duke powered Camaros and Firebirds (such a sad competition!). Moving to the V-6 paid significant performance dividends, dropping the 0-60 time by about 3.5 seconds. Of course, the V-8 was by far the best: even the automatic was in the 7 second range, while the manual could do 0-60 in about 6.5 seconds. The base price for a Capri GS was $8,331 (about $17,800 in 2015 dollars). For that money, the Capri came fairly well equipped by mid-1980s standards: external and mechanical feature included halogen headlamps, power steering, power brakes, tinted glass, and the distinctive bubble-back rear hatch with rear-window defroster. Inside, power windows, interval wipers, tilt steering wheel, and an AM/FM stereo radio were standard. Page from the 1986 Mercury Capri brochure, linked from the Old Car Manual Project’s amazing brochures section. The more sporty Capri 5.0L stickered for $10,950 (about $23,300 in today’s dollars) and added the aforementioned V-8, dual exhaust, and P225/60VR15 tires on cast aluminum wheels. Exterior options for both the GS and the 5.0L included a flip-up open-air roof ($315) or a T-Roof ($1,100). Inside, buyers could add air conditioning ($762), power door lock group ($182), speed control ($176), and an AM/FM stereo radio with cassette ($300). 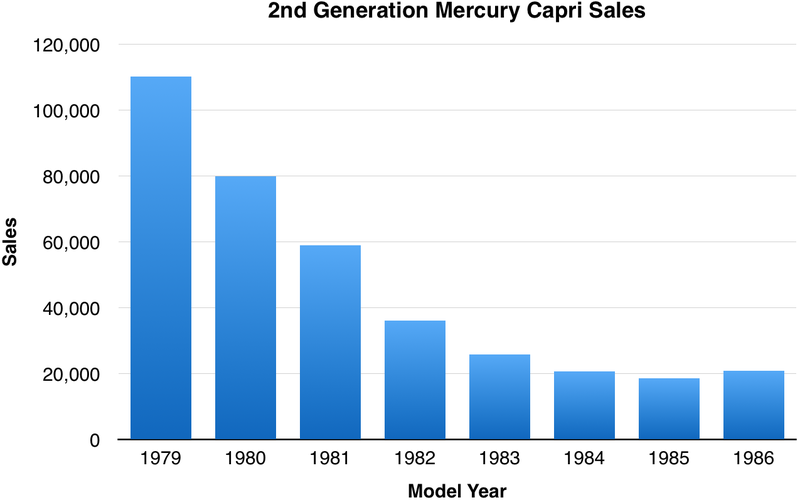 Sales for the last of the second generation Capris were not at all good, but Capri sales had not been good for years — Mercury’s traditional problem wedged between Ford and Lincoln. By 1986, Capri sales were about 9% of Mustang sales. Fox body Capris sometimes show up in the Hemming’s Motor News classifieds, but there’s definitely not a lot of activity, though I’ll say they are uncommon rather than unloved. Make mine Smoke Metallic, please.